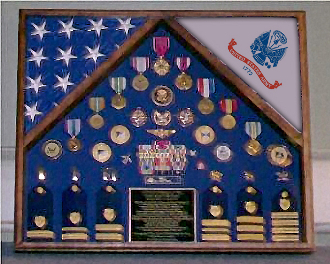 This case displays 2 flags, a USA flag with either Army or state flags, and also provides a good amount of space for your memorabilia. This case is available in either Red Oak, Walnut or Cherry and comes with a red, black, blue or green backround. 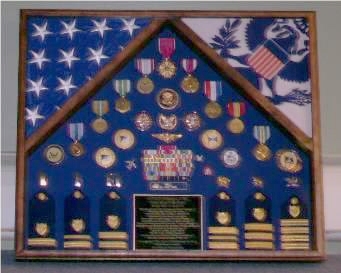 Mounting brackets is included with the Army Flag Frame. 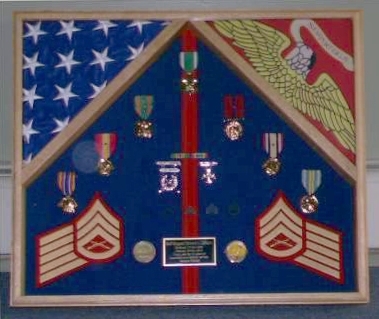 Outside dimensions are 22"x 26" x 3" for the 2 Flag and Medal . Orders for the Army flag cases are usually shipped out within one business day to places within the USA and Canada. 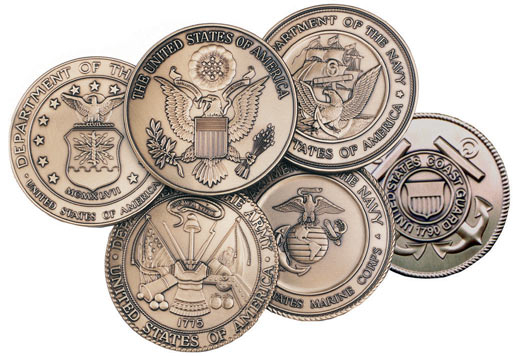 Orders for the Army 2 Flag Shadow case are usually shipped out within one business day to places within the USA and Canada. Your Army 2 Flag Shadow case represented our family well. I had no hassle in making the order and I received a very prompt delivery, well before my friend’s scheduled memorial service. Thanks for a beautiful box.